Ashley and Mitch met at work a few years before their engagement. They were introduced through mutual friends, and it was truly “love at first sight”. On a vacation to Puerto Vallarta, Mitch proposed during sunset on February 28th, 2017. The next day they celebrated with family, whom they were traveling with, which included an extraordinary dinner on the beach at the Four Seasons. Ashley said, “It was an unforgettable experience!”. 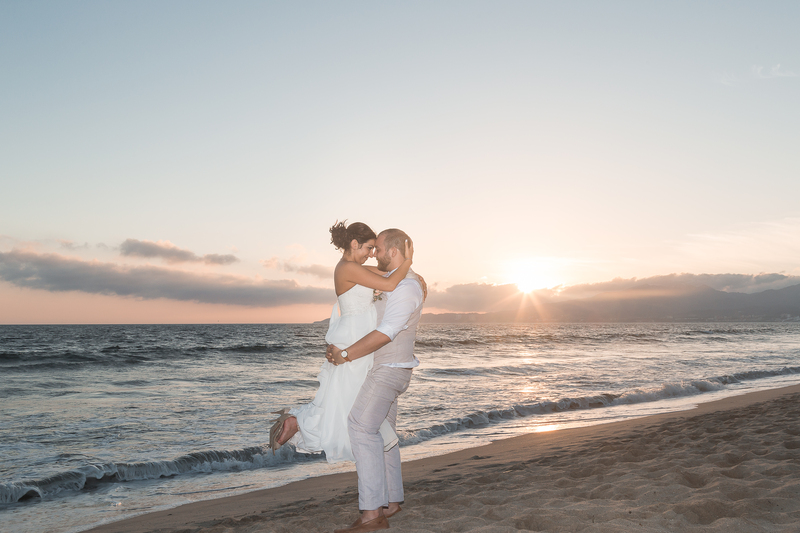 After researching options the couple decided on a destination wedding, and together with their Destify agent Brandi, they chose the RIU Palace Pacifico resort in Puerto Vallarta, Mexico. The destination held a special place in their hearts due to their engagement, and by choosing a destination wedding, Ashley said, “We knew that we could make the most of our wedding day”. The couple chose the resort because of its location, and also that it was family-friendly. There was plenty to do for both adults and kids alike. The resort proved to be the perfect fit, not just for the couple, but for their entire wedding party too. The couple hosted their ceremony on the beach at 4 pm, with the ocean waters in the background. Ashley’s father walked her down the aisle, and they were cheered on by a crowd of hotel guests who were watching. Ashley said, “This was such an awesome experience and it really added to the joy of the day”. The couple both agreed that the minister provided a short and sweet ceremony, and he said some beautiful words in honor of the couple before they exchanged vows. After the ceremony, guests attended a cocktail hour, which kept them busy while the newlyweds took sunset photos with their photographer. Towards the end of the photoshoot, their guests all joined for group photos along the beach. Then everyone met at the private reception, were the bridal party and the couple made their grand entrances, and the reception included their first dance, speeches and music and dancing into the night. Ashley’s advice is to do your research into your destination, the weather, and to stay on top of your wedding coordinator. She regrets not having a rehearsal ceremony, and on the day of their ceremony, it felt disorganized. Being in a different country with all of our loved ones surrounding us made this such an unforgettable experience!